SHANE DUFFY WAS tonight confirmed as the senior men’s international player of the year at an awards ceremony at RTÉ studios. It is the second-straight year Duffy won the award, although he wasn’t in Montrose to collect his award as a result of Brighton’s FA Cup game with Millwall going to extra-time. He is the first player to win the award on consecutive occasions since Shay Given in 2006. Darren Randolph finished second in the voting, while Declan Rice was third. As was confirmed ahead of the event, Rice was voted as Young Player of the Year and unsurprisingly wasn’t around to pick up the award. Callums Robinson and O’Dowda finished second and third respectively. Elsewhere, Leanne Kiernan won the senior women’s award, ahead of Tyler Toland in second place and Niamh Fahey in third. The Goal of the Year award – amended to include goals scored at all age grades given that the senior team managed just four in the whole of last year – was won by Aiden O’Brien, for his effort against Poland last year. Like Duffy, he wasn’t there at the studios to collect his award. Ronan Curtis was the winner of the U21 Player of the Year award, while Lee O’Connor, Brian Maher, Adam Idah, Troy Parrott, and Anselmo Garcia McNulty were winners at U19, U18, U17, U16 and U15 level respectively. The underage women’s awards went to Niamh Farrelly (U19), Emily Whelan (U17), and Jessica Ziu (U16). Dundalk’s Chris Shields was voted SSE Airtricity League Player of the Year, ahead of his clubmates Pat Hoban and Michael Duffy. There were awards too for Eoin Hayes (Junior International of the Year), Darragh Reynor (Intermediate Player of the Year), Nathalie O’Brien (Football for All), Daire O’Connor (Schools and Universities) and Ali Reghba (Schools). Richard Dunne and Emma Byrne were inducted into the hall of fame, while Georgia’s Kakha Kaladze was given the International Personality award. 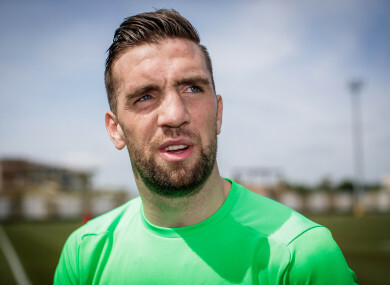 Email “Shane Duffy wins FAI Player of the Year award ahead of Darren Randolph and Declan Rice”. Feedback on “Shane Duffy wins FAI Player of the Year award ahead of Darren Randolph and Declan Rice”.